You’re probably wondering where the heck i’ve been for the past week, and truth be told, I’ve been held hostage. I’ve been held hostage by the London Olympics. And my neighbors have been held in suspended annoyance with my frequent yelling of “USA! USA! WOOOOOOOOOOOOOO”. Rarely do you see this kind of patriotism from me, but it seeps out of me like a weeping wound every 2 years (I am also an avid fan of the winter Olympics, did anyone SEE Apolo Ohno speed skate??). But there is scuba EVERYWHERE. Including the olympics, although not as a competition (could you imagine how boring that would be to watch? Hours and hours of bubbles in the pool). 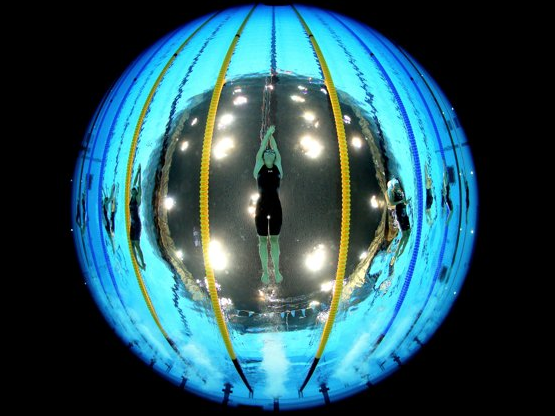 This article showcases some underwater photographers who have set up camp in the Olympic pool, which is a creative use of scuba. Check out more wonderful, awesome shots here. GO world! I love to see people go for their goals, and succeed. Probably why I love teaching Scuba in the first place. As you know, I too have been held hostage by the Olympics. It’s soo addictive! And I think they could make scuba diving an event if they turned it into a race/relay. Or maybe something like who can dive down and find the buried treasure the fastest, lol… I would definitely watch it then. And very cool photos btw.